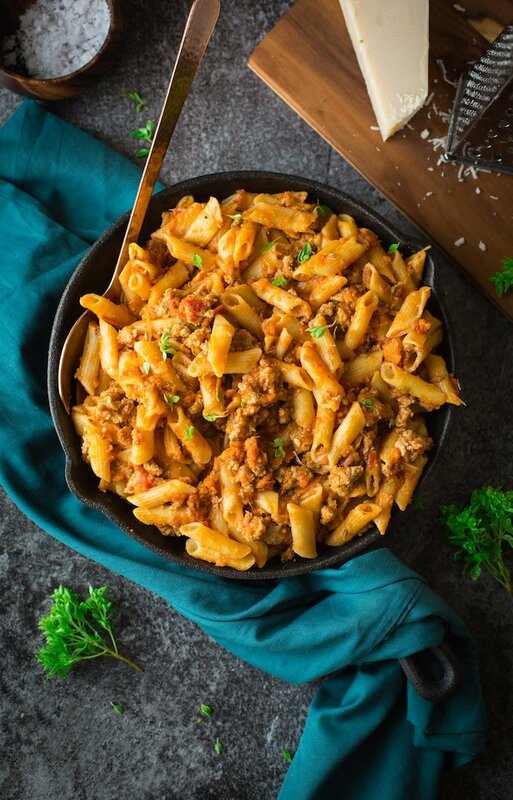 Quick, 30 minute Pork Ragu with gluten free penne – packed full of veggies and spices! 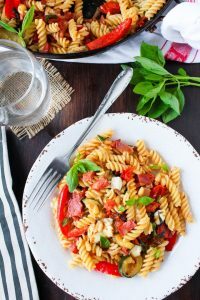 Since we don’t have any truly gluten free restaurants available to us where we live, date nights usually consist of nights in making a cozy meal together. Usually it’s something extra carb-y and indulgent. While I’d love to be the type of person who can eat pizzas & nachos every week I know I’d never be able to fit comfortably in my clothes if I did. At any rate I like keeping certain foods…special. As far as cozy, comforting and indulgent date night meals go this Pork Ragu really hits the spot. First things first: time to put your 30 minute meals head on!….That what Jamie says at the beginning of e v e r y episode so it just felt necessary here. Now that that’s done – onward! The base of this ragu starts off by blitzing together your vegetable base made up of: carrots, spring onions, celery, and chili pepper. 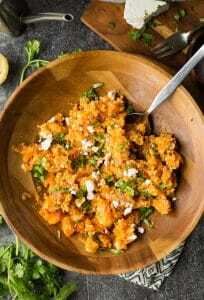 You’ll need to blitz together your vegetable medley in a food processor or blender until you get a greenish/brown paste. Fry up that paste in a skillet and wait for your kitchen to start smelling like an Italian grandmothers’ kitchen: Heaven. In a separate bowl start mixing together your meat mixture of pork mince, salt, fennel & oregano. Mix well and then toss it all in your skillet with your sautéed veggie paste and brown the meat. At this point you should get started on prepping your pasta. Always remember to salt your pasta water well – as the saying goes your pasta water should taste like sea water. Finally, return to your ragu and add the remaining ingredients: vinegar, garlic, tomatoes, water and pepper. Let simmer and reduce on a medium-low heat for about 10 minutes. When the pasta is cooked add it to the pork ragu and toss well to coat. Sprinkle over with some fresh basil and parmesan cheese if you like and eat up! Unlike more traditional ragu recipes that call for lots of stewing and simmering on the stove this one cooks up in about 30 minutes. While I opted to use plain ol’ pork mince for this you could always go the Jamie Oliver route and use pork sausage with the casing removed. This goes well with a nice, light salad on the side – something simple and fresh. 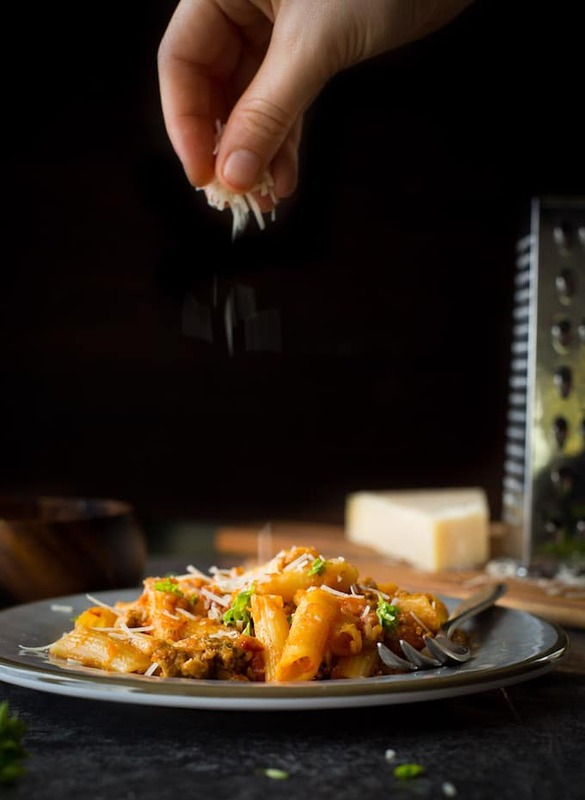 Don’t forget to #asaucykitchen on instagram if you try this Pork Ragu with Penne! We love seeing what you make! You can also post your pictures to my facebook page! 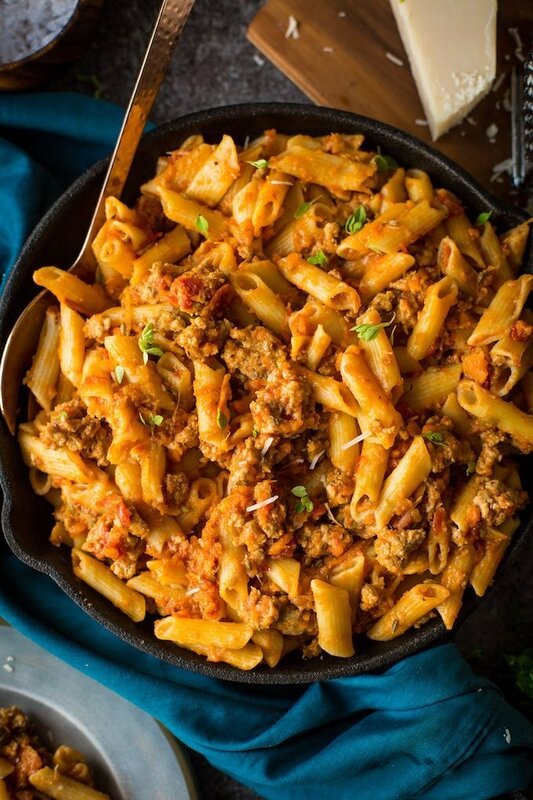 Quick 30 minute Pork Ragu with gluten free penne - packed full of veggies and spices! Roughly chop the spring onions, carrots and celery sticks before adding them + the deseeded chili to a high powered blender or food processor. Blitz it until it becomes a chunky paste. If you're using a food processor, don't worry about pre-chopping. Heat the olive oil in a large skillet/frying pan. When the oil is hot, add the vegetable paste and cook for a couple of minutes until fragrant. In a mixing bowl, add the pork mince, salt, fennel and oregano. Mix until thoroughly combined. Add the pork mixture to the frying pan with the vegetable paste and brown the meat on a medium heat, approximately 5 minutes. Fill large pot of water 2/3 of the way full and add the salt. Bring the water to a boil and then carefully add in the pasta. Cook the pasta in boiling water until al dente - springy & chewy & not mushy. It should take about 10 minutes. Make sure to stir often. Gluten free pasta likes to clump so you really need to keep it moving to prevent it from sticking together. While the pasta is cooking return to your ragu. Add in the vinegar, garlic, black pepper, chopped tomatoes + 1 cup of water and let simmer for 10 minutes on a medium-low heat. You had me until I saw fennel seeds in the ingredient list. Any suggestions on what I can sub to keep the dish flavorful? Thanks! By the way, I made your Coconut Lime Chicken yesterday and it was a hit with my family. I can’t wait to eat the leftovers for lunch today! That makes me so happy to hear! Thanks for letting me know – really glad you guys enjoyed it! No worries! You can just leave the fennel seed out if you don’t like it – there’s still so much flavour going on everywhere else that you won’t miss it if it’s not your thing! Thanks, Sarah! We had your Chocolate-PB chia pudding this morning…YUM! 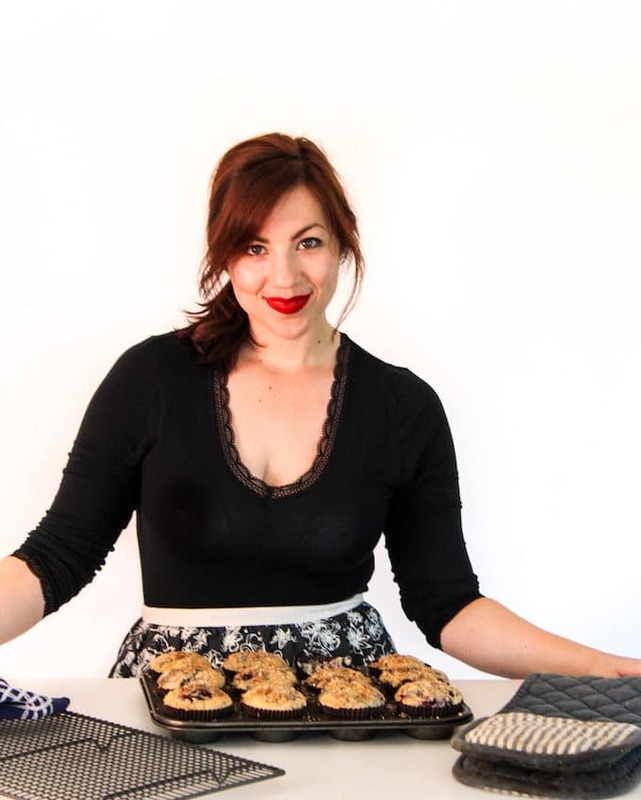 I have a growing list of your recipes I want to make. Thanks Sandra! Fennel and pork are just a match made in heaven!